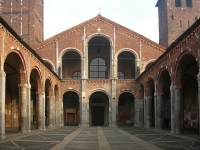 The Basilica of Sant'Ambrogio is one of the oldest churches in Milan, built by Bishop Ambrose between 379 and 386 AD. Located in an area where numerous martyrs of the Roman persecutions were buried, it was originally called Basilica Martyrum. In 1099 the church was rebuilt in the Romanesque architectural style but the basilica plan of the original edifice was maintained, including a portico with elegant arches in the front entrance. In keeping with the Lombard style of medieval architecture, the hut-like façade has a typically flat appearance. Of the two bell towers, the left and higher tower dates back to 1144 AD. Inside there is an apse mosaic from the early 13th century that portrays the Christ Pantokrator (Ruler of All), an inspirational religious and artistic artefact. The church also houses the tomb of Emperor Louis II, who died in Lombardy in 875 AD. There are mummified bishops in the chapels of this interesting and ancient church and it is one of the best churches in Milan for religious art and artefacts. Despite its notoriety as one of the oldest churches in the city, the basilica is not overrun by tourists and the place has retained its atmosphere of peace, silence and history; the pleasure of a visit here is seldom marred by crowds. Opening times: The Basilica is open from Monday to Saturday from 10am to noon, and again from 2.30pm to 6pm. Sundays from 3pm to 5pm.